When it comes to alternative energy sources, wind and solar are just the tip of the iceberg. While wind and solar may be the alternative energy sources we all know and love, there are tons of other naturally occurring power sources in the big, wide world around us. And in this case, variety is good — particularly in the face of threats like climate change and fossil fuel depletion. NASA reports that sea levels are rising at a rate of 3.41 mm per year, while some analysts suggest that oil may have already reached its peak. Meanwhile, wind and solar power carry their own sets of pros and cons; wind energy is inconsistent, while solar energy can’t be harnessed at night or on cloudy days. So, what’s a world to do? Turn awesome and surprising resources into energy, of course. We've covered the five weirdest renewable energy sources under development today. Check out our graphic below, and then read on to learn about their pros and cons — and how they can help create a more sustainable future! Space may be the final frontier, but it’s also the perfect place to collect maximum power. After all, a good chunk of solar energy is lost as it passes through the Earth’s atmosphere. By collecting solar power out in space, we can avoid that energy loss, which means one thing: more efficient energy collection, both at a higher level and for a longer period of time. In practice, this idea would involve a space-based satellite or series of panels placed high out in orbit, where the sun shines almost constantly. Then, the converted electricity could be transmitted back to Earth in a few different ways, the most exciting of which is via space lasers. However, this idea has both huge potential and frustrating drawbacks. Celebrate your sweat! Body heat is a legitimate form of energy already being used in places like Sweden, the United Kingdom, and the good ol’ United States. Specifically, the Mall of America in Minneapolis warms its buildings during the harsh Minnesota winters by recycling heat from shoppers’ bodies. That heat is transferred to different buildings through a system of pipes, water, and pumps. If the idea of sweat-powered heaters grosses you out, prepare to be even more disturbed (or morbidly fascinated): Durham Crematorium in the United Kingdom undertook a massive project in 2011 to install furnaces fitted with a heat recovery system, which includes turbines to generate electricity. On a numbers level, the plan makes sense; the heat generated during one cremation is enough to power 1,500 televisions. Scotch whisky warms the belly, ignites the spirit — and provides electricity to 9,000 homes?! Fact. During the distilling process each year, the whisky industry produces huge amounts of grains and pot ale (residue from the copper stills). Instead of just transporting all that waste off-site, distilleries in Scotland have partnered with energy companies to turn their waste into usable electricity. Scotland is home to 100 whisky distilleries, which means that this renewable energy venture makes sense on a sustainable and economic level. It also matches Scotland’s goal for renewable sources to supply 100 percent of the country’s electricity demand by 2020. Yes. Poop. Feces contains methane, which can be used the same way as natural gas. But while natural gas is nonrenewable, there will always be plenty of feces to go around because everybody poops. Both animal and human waste can be used as sources of ultra-renewable biomethane. In fact, poop can theoretically power anything that normally runs on natural gas, and because humans are wonderful and innovative beings, there are already a variety of real-world applications for biomethane (poop) in place today. 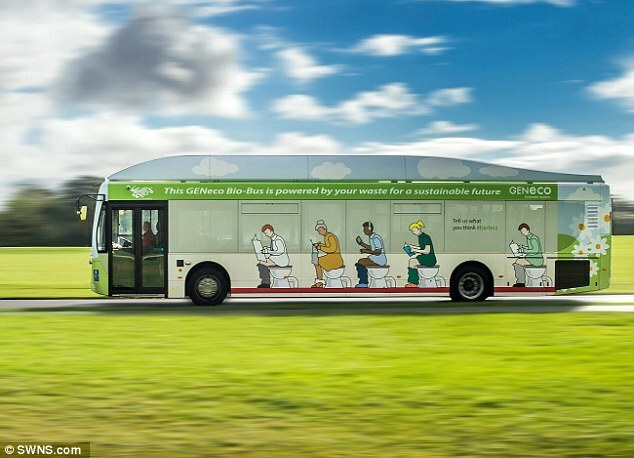 For instance, the Bio-Bus in the United Kingdom runs entirely on gas generated through treated sewage and food waste. In Colorado, the city of Grand Junction is using biomethane to power 40 city vehicles. And the waste-to-energy system in Washington, D.C. is the largest in the world, generating enough electricity to power a third of the utility company’s 157-acre wastewater treatment plant. Sure, texting and cell phone use may one day make us all hunchbacked and blind. But at least technology is evolving to justify our love of texting and replying “Maybe” to Facebook events when we really mean “No.” More specifically, piezoelectricity is a vaguely Jurassic-looking term that refers to the way some metals accumulate an electric charge under pressure. Translate that into a cell phone and you have Alexander Parker’s Push to Charge concept, which uses piezoelectricity to charge the phone through the tapping of text messages. This technology was used on a larger scale in the Netherlands at Club Watt, which used a piezoelectric dance floor to harness energy from the jumps, gyrations, and half-hearted shuffles of its clubgoers. The club has since closed, unfortunately, but for a while, partying helped the planet — and maybe it can continue to do some good moving forward. While the idea of texting and partying our way towards a sustainable future sounds great, it doesn’t look like the technology is as cost-efficient as it needs to be. In fact, the question of cost is a big obstacle with many different forms of renewable energy, particularly because the idea of something like energy-producing roads sounds great, but the real-world implementation of it is difficult on a larger scale. All these strange alternative energy sources have their promising pros and prohibitive cons (except poop, apparently). But in the meantime, green technology will continue to evolve, working to make these unconventional energy sources cheaper, more feasible, and a lasting part of our green future. "From booze to literal space lasers, renewable energy can come from the wildest sources." Wearing fair trade products can spark conversations about ethical practices that may never have happened otherwise.